I just started doing Christmas decorations in my home – meant to do them last weekend but the time just flew by. I am having my daughter’s baby shower this weekend at my home – so I guess that will be a little Baby Decoration Vs. Christmas and I don’t know how that is going to fly – but as long as everyone has a good time, nothing else matters. I thought I’d post some interesting ideas that you could whip up in this last remaining week. 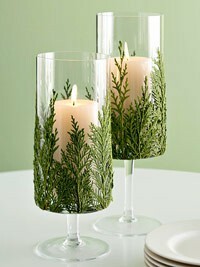 I always need to do something new for Christmas and I liked these ideas. Let me know what you think of them! Ever have some old ornaments that have lost their lustre? 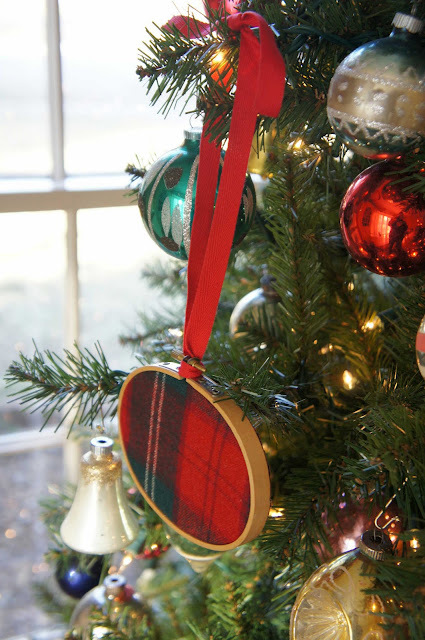 What not add some glue and glitter to them – to perk them up, as in these ornaments from Upscale, Downhome. You can buy Martha Stewart glitter at Michaels or any other glitter at arts and crafts stores. But for a real treat, why not use some Meyer’s Glass Glitter? It’s ground glass and much thicker than all other glitters. I’ve used it on chipboard letters and motifs – for any occasion, not just Christmas. You have to order it online here, but it is well worth looking in to. 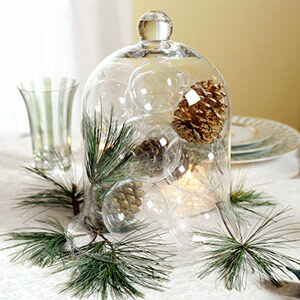 You can use the German Glass Glitter to add sparkle to pine cones too – these look great in a Christmas tree. Here’s another great idea that’s fast and inexpensive. Take some fabric and place it in a small embroidery hoop, then add a ribbon to hang. 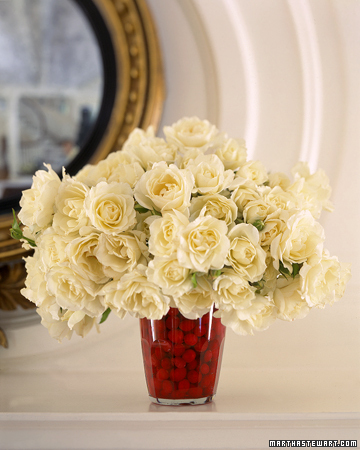 A quick and easy floral decoration idea from Martha Stewart is to use cranberries in a clear vase as a beautiful base for flowers. Make sure you use hard cranberries – or else you’ll be in trouble! Wash them well, place in a clear vase and you’ll see that they actually hold your flowers together very well. Looks great on a mantle or on your table. 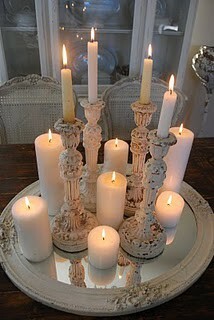 For a fabulous centerpiece, why not place some white, or off white candles on top of a mirror. It’s simple, beautiful and it’s double the glow. Another great idea is to fashion a wreath into a different shape. Do you live by the shore or do you know a boating enthusiast? 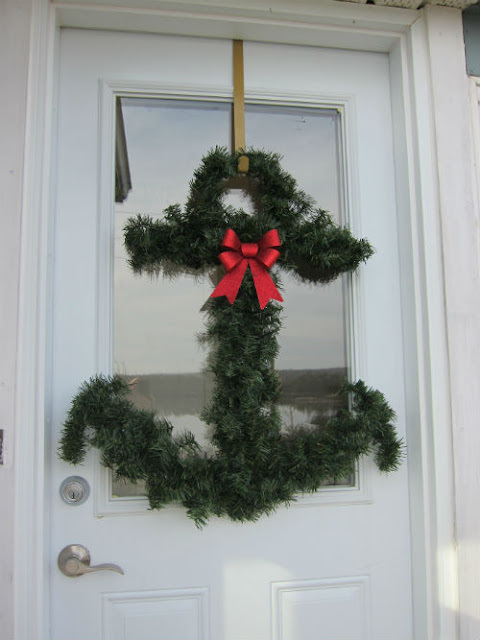 This anchor wreath would make a great door decoration or gift. There’s a tutorial on the site that will guide you in making it. 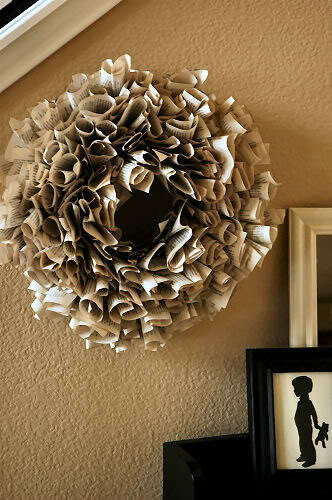 There have also been some great book page wreath ideas floating around the web lately. Living with Lindsay (a great blog) has a tutorial on how to make it on her blog. It will take a little time and patience, but I think it’s worth it. So, I hope that everyone will be ready by Christmas. As always, it came too fast this year! 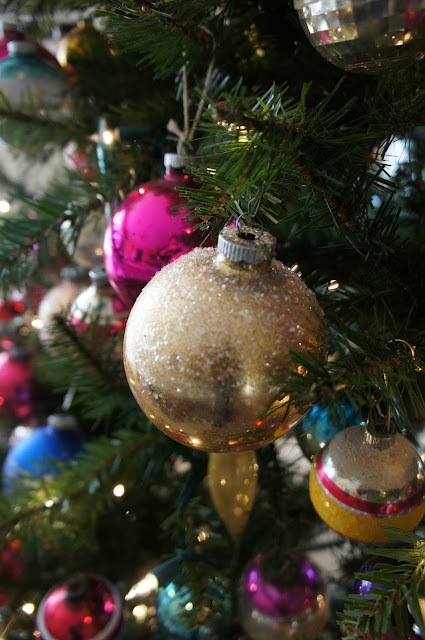 Hope these decorating ideas help you make your homes look great this Holiday Season!!! LOVE so many of these Linda! 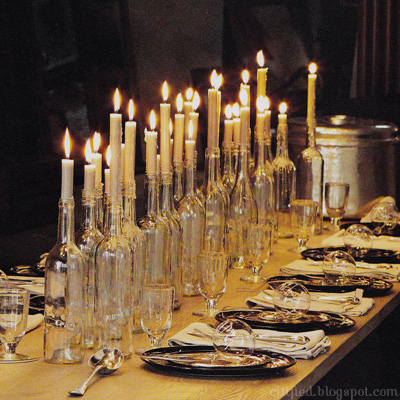 Especially the bottles with the candles down the table, and the roses in the cranberries – so sophisticated. 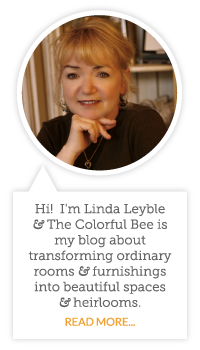 Thanks for following Color Outside the Lines, and letting me know about your blog. I'm your newest follower, and will be back often! Hey thanks so much for following and commenting! I love your blog as well (you are so creative!!). It's people like you who make me want to post a lot! Thanks again! Thanks for this great post….I really want to try the tapers in bottles.Lovely. Thanks also for commenting on my poor neglected blog.I've been busy creating my own product line out of India- Pillows, quilts, totes etc.I will show pics once I finally get the samples, but it's slow going. Hey Barry – thanks for commenting! I am a big fan of yours – you are so incredibly talented. Your artwork…your decorating ideas! I would love to do a feature on you soon – OK? Thanks again for following – and noticing! PS – I just sent a note to a paper artist, Keri (www.simpleintrigue.blogspot.com)to check out your site and your youtube videos. Hi Shawn – yes…I was missing your blogposts. I was going to write to you to see if you were OK! So glad to hear that you were busy creating beautiful textiles. Show them to me when you can – I'll do some blogposts on them. I would like more details on how to add greenery to the anchor shaped wreath if possible! I have the frame but not sure how to add the artificial greens.